A design is a good way to start in building a new home. When it comes to small house plans, their popularity is absolutely high. It is a great choice for those who want to start a family; for couples, senior citizens and for families that have 2 or 3 members. The possibilities to build a small house are limitless; some designers usually create plans with clear interior and exterior floor plans for you to choose from before you begin to build your dream home. These small houses have rooms and living space on one level for easy living and family connectivity. Some people decided to build an open floor plan with the living room, dining room and kitchen that easily accessible. This plan makes for an ideal setting for a family’s togetherness when studying, cooking, entertaining visitors, relatives and friends. In today’s article, we will present to you these 6 different styles and designs that will allow you to enjoy a simple good living. Let’s have a look! This one-story contemporary design consists of 3 bedrooms, 1 bathroom, 1 living room, 1 kitchen with 97 square meters of living area. The total budget for the construction is about 36,403 US Dollars. The house consists of 1 bedroom, 1 bathroom, a central hall and a side porch. Usable area is 37.75 square meters area with a budget of 10,617 US Dollars excluding land. The house has a total area of 75 square meters of living space consisting of 2 bedrooms, 2 bathrooms, living room, dining room and kitchen. The size of 60 square meters of living space with a total construction budget is about 16,078 US Dollars excluding furniture. This house consists of 2 bedrooms, 1 bathroom, living room and kitchen with an area of 36 square meters. The construction budget is about 10,617 US Dollars. 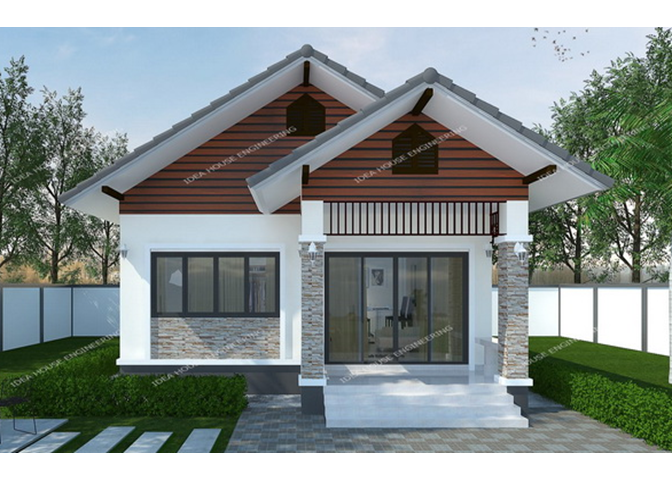 Modern style house consists of 2 bedrooms, 1 bathroom, hallway, front porch with a living space of 54 square meters. Looking Forward To Build A Dream Home? Marawi Temporary Shelter, Much Better Than Yolanda Shelter At A Lower Cost?